Flags Over The Capital is my tribute to the American spirit. Nothing brings out American pride more than a celebration with flags flying overhead and banners strung from every window. This is a time when friends, families and neighbors join together in a spectacular display of unity and patriotism. Flags Over The Capitol – 12oz Ceramic Mug (At First Light Special) Sale! 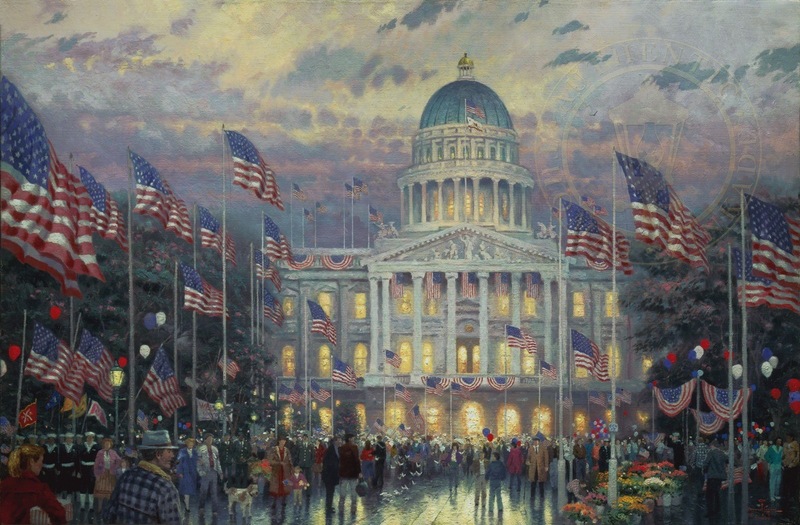 Flags Over The Capitol – Ceramic Mug Sale! they had been available before I bought mine, but I still love them. Thomas is in Heaven and I can only imagine how beautiful his paintings are there. While I cannot afford his paintings now, Jesus is busy preparing my Heavenly home and he will have put one of Thom’s paintings in every room. Thank you so much for your kind words. We appreciate having you for a Thomas Kinkade Fan and Collector. plan to order it, too. 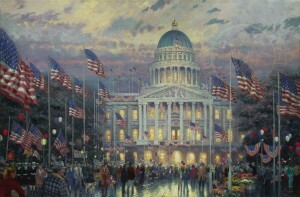 Thank You Thomas Kinkade! Thank you so much for being a collector! We are glad you are enjoying your painting, and we hope that you like your new mug, as well! I love all of his paintings. They are all like he puts himself into his pictures.